Turnstile is a form of gate which provides access to an individual at a time. It also can be utilized as a way to enforce a one-way traffic for the community in addition to restricting passage to only authorized individuals. 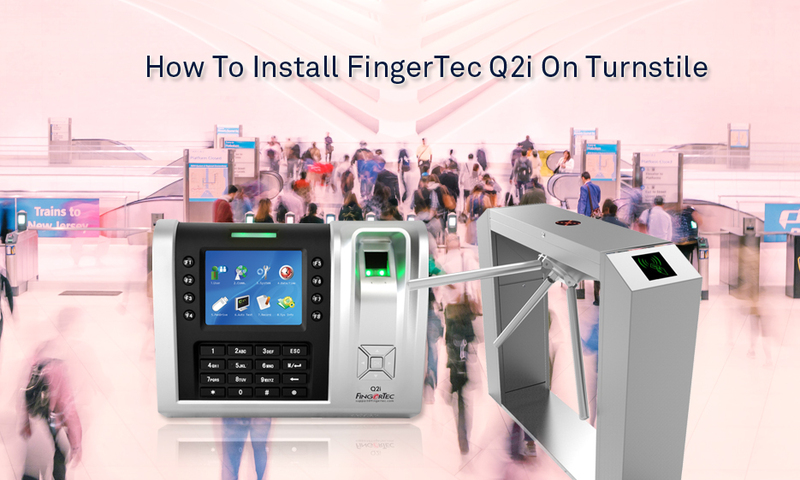 In this article, we will show you the installation diagram for FingerTec Q2i reader with the turnstile. Note in our setup: apart from using Ingress software for the access control and attendance software, we also will be applying our new TimeTec TA application as the cloud storage system to store the user and transaction data into cloud. Following the setup, users can thus use TimeTec TA to view the data at any time from any place by computers or through their smartphones. This setup is suitable for the lobby at an office building. With this setting in placed, it will allow access to authorized individuals only; while at the same time, preventing strangers from tailgating into the premise. At the back of FingerTec Q2i device; note that the NO and COM connector from the Q2i device needs to be connected to the Turnstile Controller as shown in the image below. ii. OPE-L and GND-L (respectively) to turn on the Left Solenoid. Additionally, to use TimeTec TA App and Web Application in the setup, users will need to key in TimeTec TA IP address into the terminal by proceeding to the Menu > Comm > Web Setup.